July 2018 was an extraordinary weather month across most of California. Early in the month, a searing heatwave brought all-time record heat to some locations in Southern California. While the truly extreme heat receded somewhat during the rest of the month, temperatures never cooled back to anywhere near average, and the past 3-4 weeks have been punctuated by heatwaves that have broken countless daily temperature records. Interestingly, a number of more “subtle” temperature records have fallen this July, with all-time record warm overnight temperatures occurring across a majority of the state and “consecutive 100+ degree day” records falling through parts of the Central Valley. Death Valley apparently recorded the warmest single month officially recorded anywhere on Earth. As of this week, ocean temperatures in the Southern California Bight have reached all-time record high levels (around 80 degrees F at the Scripps Pier)–bringing a seemingly endless stretch of unusually muggy conditions and extremely elevated near-coastal dewpoints into the 65-70 degree range (that’s like more like what would be expected in Washington, D.C. or even parts of the Gulf Coast in summer). Meanwhile strong oceanic upwelling just off the coast of San Francisco (with SSTs as low as 49-50 degrees!) triggered highly effective natural air-conditioning in the form of a robust marine layer–with many cool, foggy days along the immediate coastal strip of NorCal. Despite that local anomaly, this past month was not only the warmest July on record in California but actually the warmest single month recorded in the history of the state! As the figure to the left shows, a few pockets of the state experienced all-time record daytime highs, but much of the contribution to the all-time monthly warmth came from exceedingly warm overnight temperatures (which, as past research has pointed out, is a hallmark of global warming). Coincident with the all-time record heat this past July, the flammability of vegetation (as measured by both “fuel moisture” and the “energy release component”) approached or exceeded record levels for this time of year across the northern 2/3 of the state. Unfortunately, that meant that a number of human-caused fire ignitions exploded into extremely large and in some cases devastating wildfires across NorCal over the past 30 days. The Ferguson Fire has resulted in the unprecedented indefinite closure of Yosemite National Park; the Carr Fire consumed over 1000 homes near Redding and produced an exceptionally violent “fire tornado” (more on that below), and the Mendocino Complex surrounding Clearlake (composed of the Ranch and River fires) has now become California’s largest fire event in modern history–eclipsing the previous record set by the Thomas Fire just last December. (While the River fire is largely contained, the Ranch fire is still growing and may become the state’s single largest fire in its own right). These fires have also been deadly, taking the lives of four firefighters and at least five others. Meanwhile, tens of millions of Californians are currently being affected by degraded air quality as a result of widespread and locally very dense wildfire smoke. In fact, some of the worst air quality in the world this week has been in Northern California–exceeding even that of notoriously polluted megacities in China. Dr. Crystal Kolden, Dr. John Abatzoglou and I wrote a perspective piece yesterday in The Guardian on the current wildfire siege in California. In it, we point out that a confluence of factors have led to the current dire situation–including the legacy of 20th century forest management policies that disrupted natural fire regimes and the increasing encroachment of California’s urban areas into the adjacent wildlands at high risk of fire. But we also emphasize that climate change is now acting as a wildfire “threat multiplier”–greatly amplifying the other human aspects of fire risk. 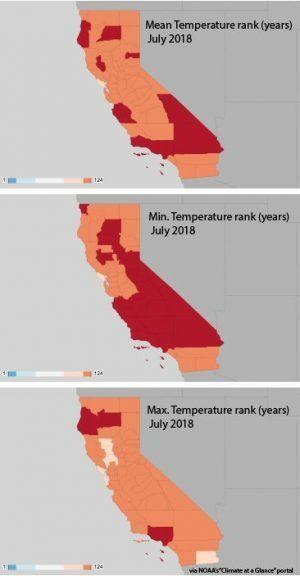 As I’ve previously discussed both in my formal research and on this blog, temperatures in California are already much warmer than they used to be just a few decades ago. Mountain snowpack is on the decline, and is melting earlier in the spring. Hotter summer and autumn temperatures are drying out vegetation everywhere, even in places that were already quite arid to begin with. And more recent evidence confirms that the fire season is lengthening–not just due to rising temperatures, but also due to the compression of our already short rainy season into an even narrower window during winter. In other words: given a spark–be it from lightning, a carelessly tossed cigarette, or even (as in the case of the Carr Fire) a particularly inopportune flat car tire–California’s wildfires are now burning more intensely, moving faster, and becoming harder for firefighters to fight (and even for folks to get out of harm’s way). And while climate is certainly not the only relevant factor, it has rapidly become an increasingly big part of the story. If you’re interested in hearing more about my thoughts on this, I’d encourage you to read the full article. On the evening of July 26, the Carr Fire made an unexpected and ultimately devastating run into the western side of Redding, CA–consuming nearly 1500 structures and taking six lives. Unlike during recent California firestorms in the “wildland-urban interface” (like those in Santa Rosa and Ventura last year), this run was not wind-driven: there were no “Diablo” or “Santa Ana”-like wind conditions. Instead, what occurred was far more remarkable from a meteorological perspective: the Carr Fire essentially developed its own mesoscale convective weather system directly on top of the system of Redding, which ultimately produced a half-mile wide “fire vortex” equivalent in strength to violent EF-3 tornado (with winds near 150 mph). Smaller, less consequential (but still dangerous) “fire whirls” are not uncommon on wildfires, but the Carr Fire vortex was of a totally different order. Several fire scientists and meteorologists who conducted some preliminary analysis of the event have come to the conclusion that the vortex may have shared many characteristics of a more traditional tornado generated by a supercell thunderstorm–an assessment with which I tend to agree. Rather than reinventing the wheel, however, I would strongly encourage interested folks to read Bob Henson‘s fascinating write-up of this event, which includes some excellent visualizations by Neil Lareau. Yesterday and today have brought yet more daily record temperatures to certain portions of SoCal (especially near the immediate coastline, where extremely warm water temperatures are no longer providing much relief). A gradual cool-down is expected over the next few days, but conditions will generally remain warmer than average (especially at night). In the meantime, a modest monsoonal surge is ongoing across the southern portion of the state. While this surge is not very impressive on its own, it may be aided over the next couple of days by deep easterly flow induced by the broad circulation around Hurricane John, now spinning off the coast of Mexico. This tropical system is expected to curve northward and stall about 750 miles southwest of Los Angeles this weekend, spinning in place until dissipation. While none of the models are currently generating much convective precipitation over the state (mostly just mid and high-level clouds), this event does appear similar to past events when a decaying offshore tropical system sent a bit more moisture/energy our way that had been initially anticipated. While widespread activity is not expected, there may be a slight chance of some thunderstorm activity just about anywhere in the state this weekend as John’s remnants remain nearby. Not a high likelihood event by any means, but something worth keeping an eye on. In the even longer range, unfortunately, the heat appears likely to return once again. 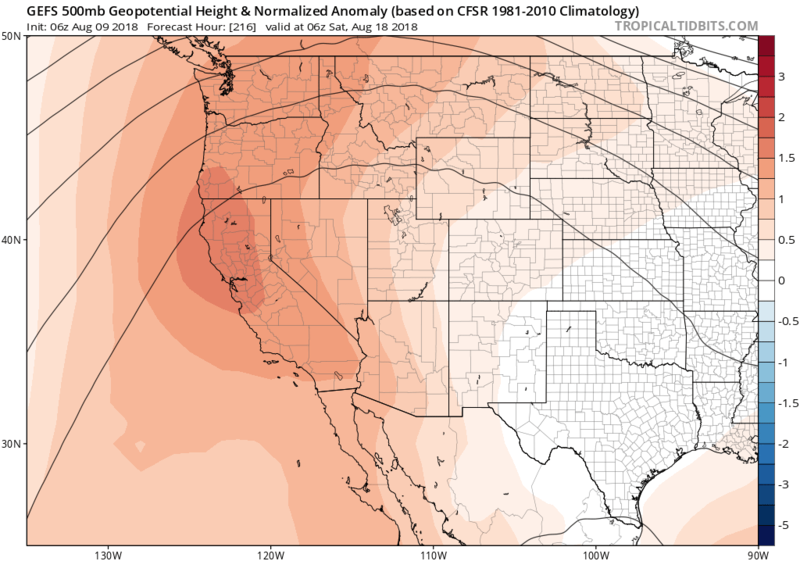 The ECMWF and GFS ensembles are in agreement that a fairly strong West Coast ridge will re-build once again by mid-August, bringing hot conditions to essentially the same locations that have already been experiencing them all summer long. The only good news from a fire weather front is no widespread dry lightning or strong wind events are currently on the horizon. Some personal news: an institutional transition, but the Weather West blog will remain! In the coming weeks, I’ll be transitioning into a new role as a climate scientist with simultaneous appointments at three separate institutions: the UCLA Institute of the Environment and Sustainability, the National Center for Atmospheric Research, and The Nature Conservancy. While I will now be physically located in Boulder, CO, this exciting (and decidedly novel!) partnership across public and private institutions will allow me to continue my climate and weather research while expanding my engagement with broad audiences through blogging, science writing, interactions with policymakers, and collaborations with journalists. But never fear: the good news is that the Weather West blog will remain exactly as it is today–I’ll continue to focus on California weather and climate issues, with occasional deeper-dives into the broader climate context of recent events. To those who continue to contribute to the vitality of the Weather West community: a heartfelt thank you once again!